Today's Democracy Now! 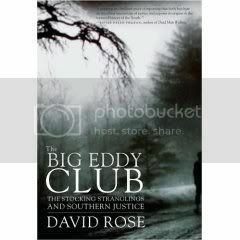 radio show features an interview with Vanity Fair reporter David Rose, who has a new book out on the infamous "Stocking Stranglings" that took place in Columbus, Ga. in the late 1970s. The case involved a serial killer who raped and murdered several elderly, well-to-do white women in their beds. In 1986, eight years after the last murder, an African-American man named Carlton Gary was convicted and sentenced to death for three of the killings -- though no physical evidence was found to link him to the crimes. Then two years ago, a new piece of evidence turned up: a long-missing bite-mark mold taken from the last victim. Gary's attorney argued that the mold did not match his client's teeth. But last week, U.S. District Court Judge Clay Land ruled that the new evidence is not enough to challenge Gary's conviction. The case now goes to a federal appeals court in Atlanta. In my book, I've not just talked about the case. I've talked about the whole kind of history of race relations in Columbus, Georgia. And I've gone back to even before the Civil War and shown, I think, how that history of violence and racism and oppression has fed into this case. But there is one incredible thread that runs through it, which is the role of a single family, begins with a man called Aaron Brewster Land, who was responsible for two absolutely horrendous lynchings in the early part of the 1900s. We move to his son, John Land. John Land covers up the death of the black civil rights leader in Columbus, Thomas H. Brewer, in 1956, and he then makes the decisions in Carlton Gary's case, by the time of which, of course, he's become a judge. He had been the district attorney in '56. He makes the decisions, which deny Carlton Gary funding for his trial. And now it's his great-nephew who is the federal judge, who holds Carlton Gary's fate in his hand. It's Judge Clay Land of the federal court of Columbus who now has to decide whether to give him a new trial. So there's this extraordinary continuity of more than a century, and this one family kind of represents this. And it's down to Clay Land to decide whether to do the right thing. To listen to the entire interview or read the transcript, click here.